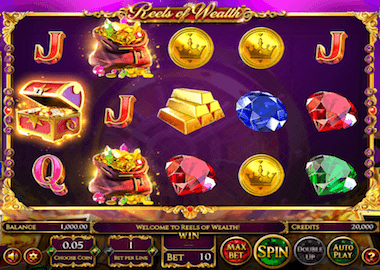 The Reels of Wealth Slot is a five reels slot with three rows and 10 paylines and comes from slot developer Betsoft Gaming. The slot belongs to the category Gemstone Games and is available on Smart Phones, Tablets and Desktops. The minimum bet on the Reels of Wealth slot is 10p and you can bet up to £100 per spin. The Betsoft slot has a fantastic gameplay with great features. That’s include a Rolling Win feature, Multiplier Wilds, Scatter Pays and 4 Progressive Jackpots. Symbols and Payouts: The symbols of the Reels of Wealth slot are typical gems symbols which are complemented with playing cards symbols. There are the playing cards J, Q, K and A which pay up to 20x your bet. Themed symbols include a gold coin, gold bars, money bundles, a bag of gems, a treasury chest and 3 different gems. The treasure chest is the most valuable symbol and pays up to 200x your bet for a combination of 5 identical symbols. There is also a Wild Symbol and Scatter Symbol. Rolling Wins feature: The Rolling Win feature is a great feature. Betsoft Gaming proves with the Rells of Wealth slot that a game is great even without Free Spins feature. The Rolling Win feature starts every time you make a profit. Three identical symbols from left to right and right to left trigger wins. You will then get re-spins as long as you land more winning combinations on your reels. From the 5th re-spin you get a 2x win multiplier and from the 8th re-spin you get a 3x multiplier on your standard win. Wild Multiplier and Scatter: The Wilds Symbols are another feature that can start at any time. For this the Wild Multiplier symbol must land on your 2nd or 4th reel. The symbol replaces all symbols except the scatter symbol. If both wilds land on the reels at the same time you will receive a 4x Win multiplier. The scatter symbols are especially valuable. A single scatter already means a profit and pays 10 coins. Up to 15 Scatters can land on your reels and trigger a top prize of 20.000 coins. In addition to the features described above, the Reels of Wealth slot also has 4 progressive jackpot levels. There is the Hero Jackpot, Star Jackpot, Legend Jackpot and Mega Star Jackpot. To win one of the jackpots, you must trigger the Mega Star feature with three Mega Star symbols. You can try the Reels of Wealth slot for free if you click on the banner above. You can find more Betsoft Gaming online slots here. Available UK Casinos with Betsoft Gaming slots are the Wild Slots, Casino Luck, Next Casino. All casinos have welcome offers for you, so join and play with a nice advantage.